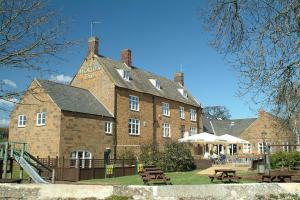 Choose from 38 hotels and guest houses in Northamptonshire. Shown below a just a selection of the hotels available. To search within an area please use the menu on the right. This Premier Inn hotel is 1.5 miles (2.4 km) from Kettering town centre, with free parking, family-friendly en suite rooms and an on-site Brewers Fayre restaurant. The Premier Inn Kettering is well placed for Kettering Leisure Village, Rockingham Speedway, Rockingham Castle and Wicksteed Theme Park. Some rooms can take 2 adults and up to 2 children (under 16 years). The 2 children also get a free full breakfast when accompanied by an adult eating a full breakfast. The full all-you-can-eat breakfast has the expected cooked items, including vegetarian sausages, as well as a wide continental selection. Just off the M1 motorway, with good access to the M6 and the region's major road network, the Ibis Rugby East offers free parking and en suite rooms at great-value rates. Just a few hundred metres from junction 18 of the M1, the Ibis Rugby East has a convenient location, whether you are visiting Rugby on business or exploring the area as a tourist. The hotel's excellent access to the M40, the M69, the M42, the A14, the A5 and A45 means that all that the region has to offer is within easy reach. All of the en suite rooms have tea/coffee making facilities and wireless internet access available at an additional cost. Snack-bar facilities are available 24 hours a day and the air-conditioned restaurant is open from 18:00 to 22:00. The restaurant offers a full ? la carte menu and also has an open air terrace for dining alfresco. Free private parking is available on site. Within easy access of the M1 yet in a peaceful village location, this hotel provides value-for-money accommodation for business and leisure guests alike. As well as being approximately 5 miles from Northampton and Daventry town centres, there are many attractions within a short drive of the hotel, such as Althorpe House, Sulgrave Manor and Cotton Gardens. The Holiday Inn Northampton West M1 Junc 16 has 7 conference rooms with natural daylight and air conditioning. Special all-inclusive conference packages are available for day or overnight meetings. With our fully-equipped equipped exercise room with state-of-the-art cardiovascular equipment, maintaining your fitness regime won't be a problem during your stay. On the A428 into Northampton, within easy reach of junction 15 of the M1 motorway, the hotel offers great value, with free parking and spacious, comfortable and modern en suite rooms. The Premier Inn Northampton Bedford Road/A428 has a convenient location with good access to Northampton's town centre, as well as the region's major roads, including the A45. The hotel has a 24-hour reception desk and some rooms can take 2 adults and up to 2 children (under 16 years). The 2 children also get a free full breakfast when accompanied by an adult eating a full breakfast. An all-you-can-eat buffet breakfast is available each morning and includes the expected cooked items such as scrambled, fried, poached or boiled eggs, and pork or vegetarian sausages. There is also a wide continental selection. The on-site restaurant offers good food and drink at great-value prices, whether you are after a relaxing dinner or a quick snack and a drink. On the waterfront, with a sun terrace looking out over the marina and Billing Aquadrome, the hotel offers great value, with free parking and spacious, comfortable and modern en suite rooms. Just off the A45, the Premier Inn Northampton Great Billing/A45 is only 7 miles (11.3 km) from junction 15 of the M1 motorway. Silverstone motor racing circuit is less than 20 miles (32.2 km) away. The hotel has a 24-hour reception desk and some rooms can take 2 adults and up to 2 children (under 16 years). The 2 children also get a free full breakfast when accompanied by an adult eating a full breakfast. An all-you-can-eat buffet breakfast is available each morning and includes scrambled, fried, poached or boiled eggs, and pork or vegetarian sausages. There is also a wide continental selection. The on-site restaurant offers good food and drink at great-value prices, with a Wacky Warehouse to keep the kids entertained. 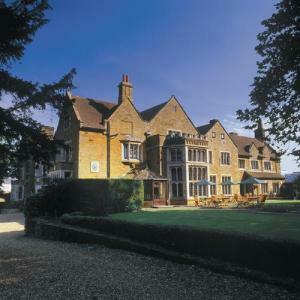 This charming hotel rests in a picturesque little village, one and a half miles from Silverstone racecourse. Here, comfortable accommodation is found in a converted barn, offering modern facilities whilst retaining a rustic feel. The hotel pub has recently been refurbished to a high standard. The award-winning chef sources local produce for his dishes. The restaurant offers a relaxed dining experience. Owners and hosts Sheena and Peter offer a warm welcome to The Kings Head. Situated just off the a14, with easy access from the m1, m6 and a1, this luxury 4* hotel offers an ideal location for both business and leisure guests. It has a cosy atmosphere, air-conditioned Executive bedrooms, aa rosette restaurant and first class Spa, including 13m pool, gym, sauna and steam room. The purpose-built meeting rooms are ideal for company training and conferences. Woburn Safari Park, Wicksteed, Silverstone and Rockingham are close by. Free parking and high-speed WiFi access. 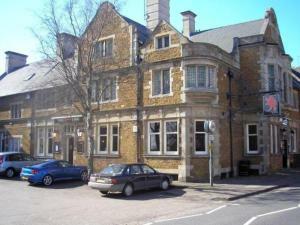 Premier Inn Wellingborough is in the south of the town, close to the A45 and Denington Industrial Estate. Expect the usual Premier Inn features: an on-site Beefeater restaurant, free parking and very comfortable beds. Some rooms at Premier Inn can take 2 adults and up to 2 children (under 16 years). The 2 children also get a free full breakfast when accompanied by an adult eating a full breakfast. The full all-you-can-eat breakfast has the expected cooked items, including vegetarian sausages, as well as a wide continental selection. With wonderful views of unspoilt countryside, this charming former coaching inn has a peaceful, rural location in the heart of Northamptonshire, famously known as the Rose of the Shires. In the mid-17th century, the Benefield Wheatsheaf Country Inn and Restaurant was a coaching inn. Today, the building still retains many of its traditional original features while offering modern comfort, style and service. All of the en suite rooms have tea/coffee making facilities and TVs with Freeview digital channels. The oak-beamed bar, open fire and snug provide a warm atmosphere in which to enjoy real ales, fine wines and cocktails. The purpose-built Garden Room Restaurant has uninterrupted views of the beautiful surrounding countryside and access to the gardens for al fresco dining in the warmer months. The finest, freshest ingredients are sourced from carefully selected local suppliers and the inn's Seven Wells beef and lamb is all raised and prepared locally. A full traditional cooked English breakfast is included in the price Near both Oundle and Corby, the Benefield Wheatsheaf is the perfect rural hideaway, surrounded by beautiful, tranquil countryside. In the landscaped grounds of the University of Northampton, close to the Northamptonshire countryside, the Sunley Management Centre offers en suite accommodation, free Wi-Fi and free, secure parking. In 101 acres of landscaped grounds, the Sunley Management Centre is a relaxed alternative to traditional hotel accommodation. The 29 well-appointed en suite rooms are convenient, comfortable and affordable. Every room has a TV, tea/coffee making facilities and an en suite bathroom with a bath and shower. Free Wi-Fi is available in the public areas and a buffet-style breakfast is included in the price. Regarded by the local business community as a premier residential conference and meetings venue, the Sunley Management Centre can accommodate meetings and events for anything from 2 to 150 people. The friendly and attentive team are on hand to help you relax and unwind from the hectic pace of modern life. 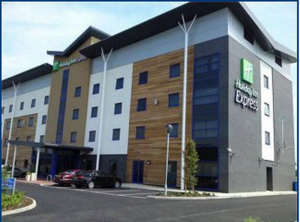 Holiday Inn Express Kettering offers good-value, contemporary accommodation and free Wi-Fi internet access. There is good access to the A14 and Kettering Rail Station is a short drive away. All of the modern, spacious rooms have a flat-screen Freeview TV and en suite facilities with a power shower. A complimentary continental breakfast is provided. Enjoy a drink or snack in the comfortable Great Room at Holiday Inn Express Kettering. Rockingham Castle and Althrop House are a short drive away. Free secure parking is available. In 13 acres of beautiful, peaceful grounds, in the pretty village of Chapel Brampton, Sedgebrook Hall has an indoor pool, a gym and modern en suite rooms housed in separate accommodation wings. Sedgebrook Hall is a country house just 5 miles (8 km) from Northampton. The hotel has a superb health and leisure club, housing the pool, the gym, an all-weather tennis court, a 3-par pitch and putt and a sauna. The comfortable and modern en suite rooms are in separate accommodation buildings, in the grounds. The menu in the restaurant changes regularly to reflect the freshest seasonal produce available locally. 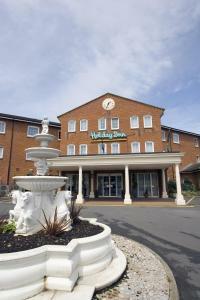 Quiet and peaceful, the hotel is within easy reach of the M1 and M6 motorways. The good location and great-value rooms make Sedgebrook Hall a good base from which to explore local attractions and events, including Silverstone, Althorpe House, Rockingham Speedway and Towcester Racecourse. Opened in 2009, this fresh, modern hotel has air-conditioned rooms, a restaurant, free Wi-Fi and free parking, 10 minutes' drive from central Northampton with easy access to the M1 and Silverstone. The Campanile Northampton is a reliable, relaxing environment next to junction 15 of the M1, 3.5 miles (5.6 km) from Northampton Station and 35 miles (56 km) from Luton Airport. Bright modern rooms include satellite TV, hospitality trays and free Wi-Fi internet. The Campanile offers a 24-hour reception. The restaurant and bar are open every day from 12:00 until 22:00. The Campanile Northampton has 5 meeting rooms and seminar space. Set on the edge of the village of Ecton, on the A4500 midway between Northampton and Ecton, this splendid boutique-style residence provides comfortable and modern rooms, alongside great food, beers and wine. The 20 brand-new rooms are each equipped with the most modern comforts, including an LCD TV, broadband internet access, telephone, under-floor heating and private bathroom with bath and shower. Take time to relax in the bar areas, or enjoy a meal in the contemporary restaurant, but please book in advance to avoid disappointment. This Victorian coaching inn, set in the beautiful village of Waddesdon, offers comfortable accommodation with a warm, friendly atmosphere. Guests can take a walk through the famous Waddesdon Manor. Built in 16th century French chateau style, here you will find an impressive array of art including work by Gainsborough and Reynolds. The house is set in beautiful Victorian gardens, with a rococo style aviary that houses exotic birds. Aylesbury is 5 miles away, offering all the facilities of a busy market town, while Bicester village, a designer outlet centre, is only a 20 minute drive away. Heathrow, Birmingham and Luton airports are all within an hour's drive. The hotel offers classic British food from a la carte menus. Surrounded by beautiful, tranquil countryside and offering a warm welcome, this country house hotel with restaurant and spa is the epitome of elegance. You'll find 44 luxurious en suite bedrooms, each with its own unique design, comfort and style. The restaurant proudly resides in the oak and linen panelled dining hall, with ambient lighting, modern English food and a superb wine cellar. The newly opened spa, features a swimming pool, indoor and outdoor jacuzzis, gym facilities, tennis courts, and beauty treatment rooms. Rushton Hall is an ideal venue for weddings, receptions and business events. In the heart of Northamptonshire within easy reach of some of the most beautiful countryside and stately homes, this fully air conditioned hotel is conveniently located for leisure stays. The M1 motorway is easily accessible, as are Birmingham, Luton and East Midlands airports. For speed demons the hotel is perfectly located for Rockingham Speedway, home to 2007's British Touring Car Championships. The F1 Grand Prix at Silverstone is a 40 minute drive away. Why not visit Rockingham Castle and see where Charles Dickens spent many a summer or Wicksteed Leisure Park for a great family day out. 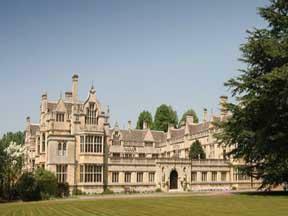 Retrace Jane Eyre's footsteps in the Georgian town of Stamford or explore Burghley House, a grand Elizabethan mansion. Althorp House, resting place of Diana Princess of Wales, is nearby too. Premier Inn Daventry is 6 miles (9.7 km) from Daventry town centre, and within easy reach of the M1 motorway, Northampton, Silverstone and Rugby. 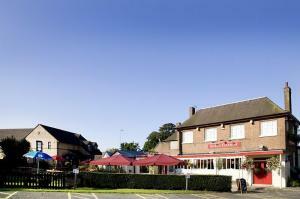 On site is a Chef & Brewer country-style pub/restaurant, meeting facilities and free parking. Each room has very comfy beds. Some rooms at Premier Inn can take 2 adults and up to 2 children (under 16 years). The 2 children also get a free full breakfast when accompanied by an adult eating a full breakfast. The full all-you-can-eat breakfast has the expected cooked items, including vegetarian sausages, as well as a wide continental selection. On the outskirts of Corby, just 3 miles (5 km) from heart of the town centre and with good access to Kettering, the hotel offers comfortable, great-value rooms and free parking. The Premier Inn Corby is situated between Corby and Kettering, with good access to the area's major roads. Corby is developing rapidly and has a new railway station, offering hourly services to and from London. The hotel is less than 6 miles (10 km) from Rockingham Motor Speedway. The hotel has a 24-hour reception desk and some rooms can take 2 adults and up to 2 children (under 16 years). The 2 children also get a free full breakfast when accompanied by an adult eating a full breakfast. An all-you-can-eat buffet breakfast is available each morning and includes scrambled, fried, poached or boiled eggs, and pork or vegetarian sausages. There is also a wide continental selection. The on-site Beefeater restaurant serves freshly cooked char-grilled food. Our venue is a striking country mansion in the picturesque Northamptonshire village of Creaton. Originally a coaching inn, it has evolved into a superb venue for all kinds of events. Its continued development has been careful to maintain the beauty of the original building, successfully combining 17th century charm with 21st century comfort. Highgate House is only a short distance from Northampton, The Historic Althorp House and the M1, M6 and A14. The historic, family atmosphere is strong throughout the estate, but is perhaps most noticeable in the rooms in and around the main house; each containing centuries of memories almost tangible to those within. Please note that the hotel has no lift. Not all accommodation is in the 17th century building, most is in modern extensions across from the property. 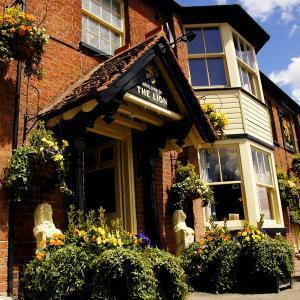 The Red Lion Hotel is a fully refurbished hotel in the centre of Rothwell, just 3 miles (5 km) from the centre of Kettering and its direct rail link to London. The hotel offers a range of accommodation to suit the needs and budget of any traveller. Some rooms have en suite bathrooms and rooms without en suite bathrooms are also available. Breakfast and evening meals are available and the bar in the hotel serves many traditional real ales, beers and lagers, as well as a wide selections of fine wines. The hotel also offers Sky satellite TV in the bar area, including Sky Sports and Setanta Sports. Just off the A45, less than 2 miles (3.2 km) from the very heart of Northampton's town centre, the hotel offers great value, with free parking and spacious, modern en suite rooms. Premier Inn Northampton South (Wootton) has a convenient location with good access to the town centre and the region's major roads. The hotel has a 24-hour reception desk and some rooms can take 2 adults and up to 2 children (under 16 years). The 2 children also get a free full breakfast when accompanied by an adult eating a full breakfast. An all-you-can-eat buffet breakfast is available each morning and includes the expected cooked items such as scrambled, fried, poached or boiled eggs, and pork or vegetarian sausages. There is also a wide continental selection. The on-site restaurant offers good food and drink at great-value prices, whether you are after a relaxing dinner or a quick snack and a drink. In Northampton town centre, just 200 metres from the train station, the hotel is within the Sol Central leisure complex, which has a cinema, a casino and a fitness club. The Ibis Northampton Centre has an excellent central location, just a short walk from Northampton Railway Station and within easy reach of the M1 motorway. Golf and tennis facilities are available only a few kilometres from Northampton. There are 151 rooms, including 8 rooms suitable for disabled guests, wheelchair users and those with reduced mobility. Wireless internet access is available in some rooms at an additional cost. The hotels amenities also include the Le Cafe Restaurant and a bar offering snacks 24 hours a day. Private parking is available at an additional cost at a location nearby and the hotel also accepts pets (additional costs may apply). Just off the A45/A46/A509, less than 1.5 miles (2.5 km) from the town centre and just 2 miles (3 km) from Wellingborough railway station, the hotel offers free parking and great-value en suite rooms. With good access to the area's main roads, the Ibis Wellingborough has a convenient location for some of the region's major annual events, such as Santa Pod drag racing, the Silverstone Formula 1 Grand Prix and the Northampton Festival. There are numerous pubs and restaurants nearby and the hotel has its own on-site bar, serving snacks 24 hours a day. All of the en suite rooms have TVs and internet access is available at an additional cost. Reception is open 24 hours a day. In Northampton town centre, the hotel is near to the historical market place and all the shops, the cinema and the casino. The hotel was fully refurbished in 2009. Easily accessible from the M1 and only a 5-minute walk from the train station, Park Inn Northampton is in a prime location. 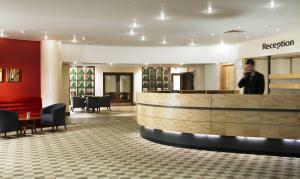 The hotel has 146 bedrooms including business friendly rooms, and meeting rooms for up to 600 delegates. Indulge at Horns restaurant and bar after a relaxing session at Innaction Health and Fitness Club, or treatment in the hotel's beauty salon.